It's that time again, The Lady Varnishes July Disney Girl and Villain! As per usual these hit it way outta the park. 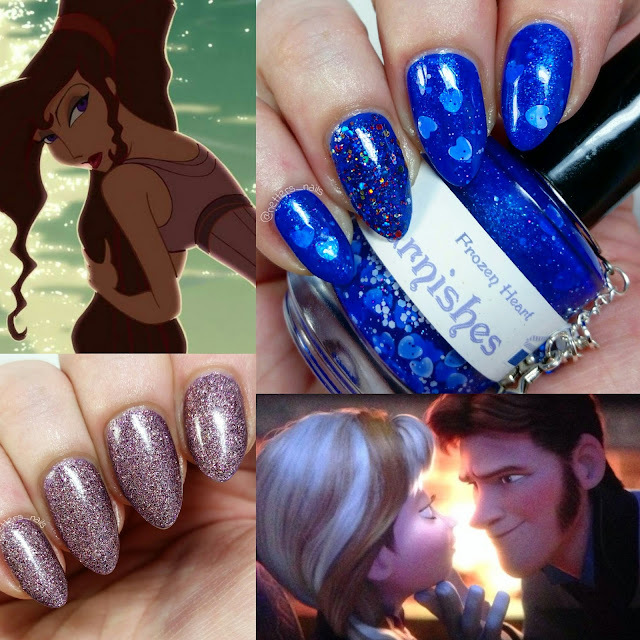 First up is Frozen Heart, inspired by Prince Hans of the Southern Isles, and the mini minon Duke of Weselton. 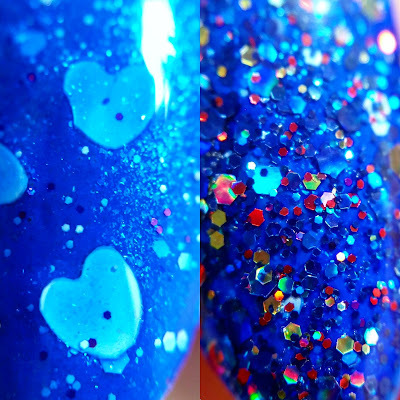 This stunning vibrant blue is packed with blue shimmer and violet micro glitters that give it a purple flash. There are also various sized matte white glitters that resemble snow and of course large white hearts. 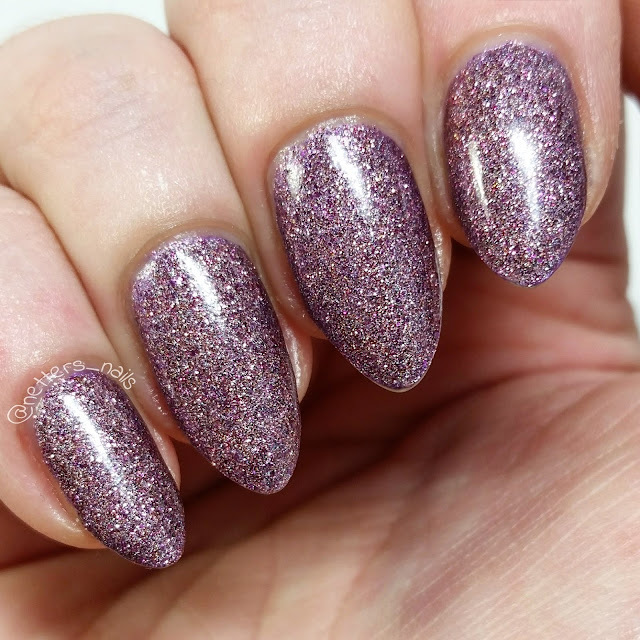 The formula was wonderful, covering in two coats and since I left it upside a bit before application there was no fishing for hearts. The mini minon included was the Duke of Weselton, a packed glitter topped with metallic blue, red, gold, and fushia hexes in various sizes. 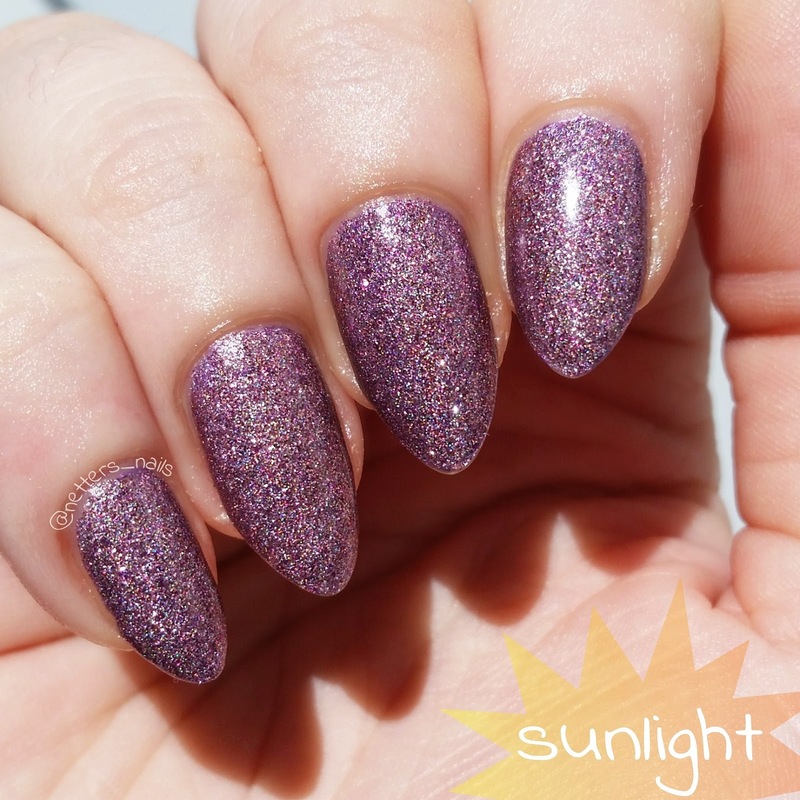 Shown is 2 coats over Frozen Heart. The Disney Girl this month is I Can Handle This, inspired by Megara and one of the favorite quotes of my childhood. "I'm a damsel. I'm in distress. I can handle this." I Can Handle This is a full coverage microglitter like all of the Disney/Pixar girls and has the same wonderful 2 coat coverage. 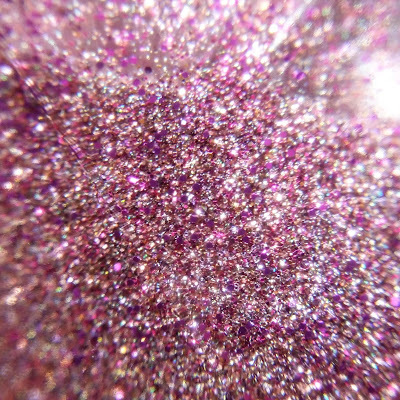 This was a complicated one to photograph thought because it can be both pink or purple depending on lighting. 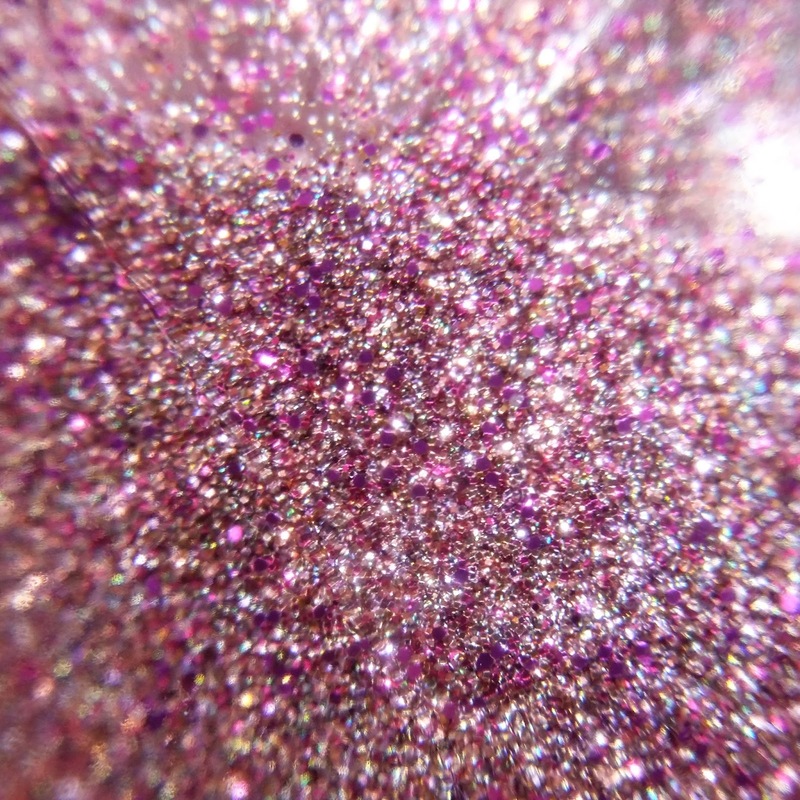 It seems to be a super fine baby pink base micro shimmer, with fushia and pink glitters and an almost gold flash. All of which is crazy holographic. In some lights though it looks lavender, in others a brighter pink or lighter pink. These are both truly must haves! 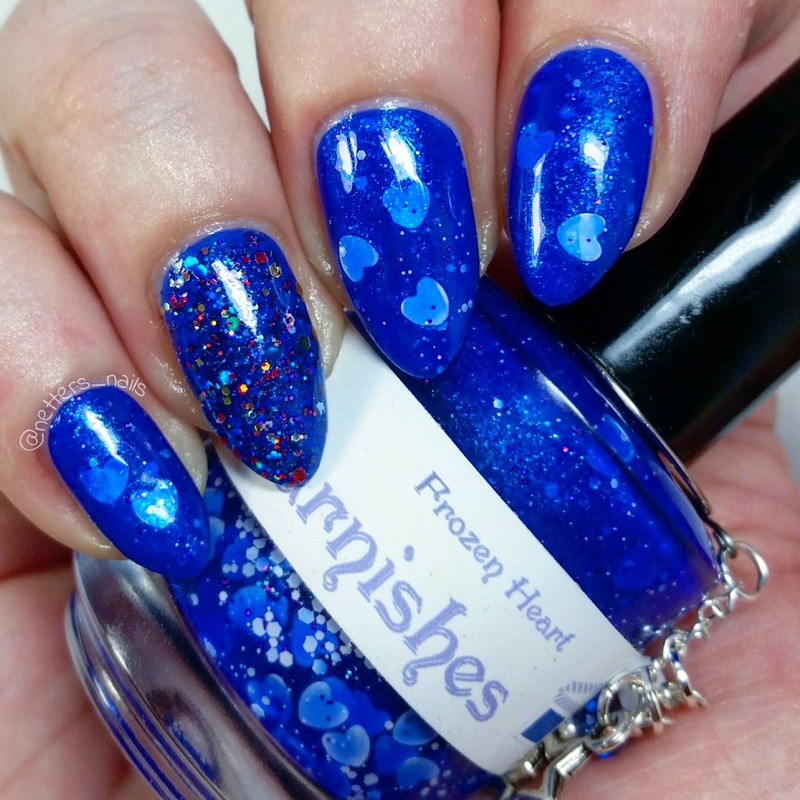 I couldn't stop staring at how vibrant the blue was of Frozen Heart and catching I Can Handle This in every light. Both are still available in The Lady Varnishes etsy shop!